Since it was my first time at CG I was thrilled that they offered us a generous three course meal. We started with a single lollipop lamb chop, as well as appetizers of calamari, prosciutto wrapped mozzarella, and caprese salad. The mozzarella is made in house, which was quite delicious in the prosciutto. I loved the calamari served with hot Cherry Peppers. It was fried but not too over done, and the peppers added a nice kick (maybe too much depending on the person). 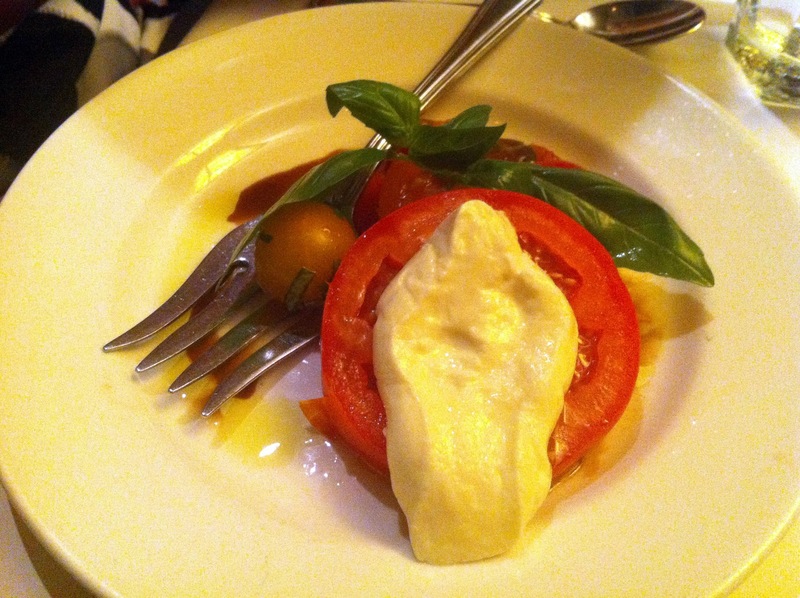 The regular caprese was only ok compared to the other sides. 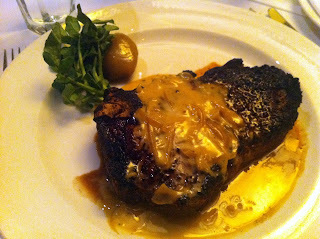 My main course was the Bone-In Kona Crusted Dry Aged Sirloin with Shallot Butter (pictured at top). It was a very tasty piece of steak. I loved the blackened crust, which had Kona (i.e. coffee) in it and the shallot butter was an excellent addition. The portion size was plenty for me and if I had any self restraint I should not have finished my plate. In addition to the steak, there were sides of lobster mac 'n cheese and spinach passed around. 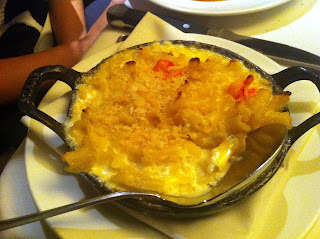 I thought the mac was good, but Erica knows her mac and said it was one of the best she's had in a while. 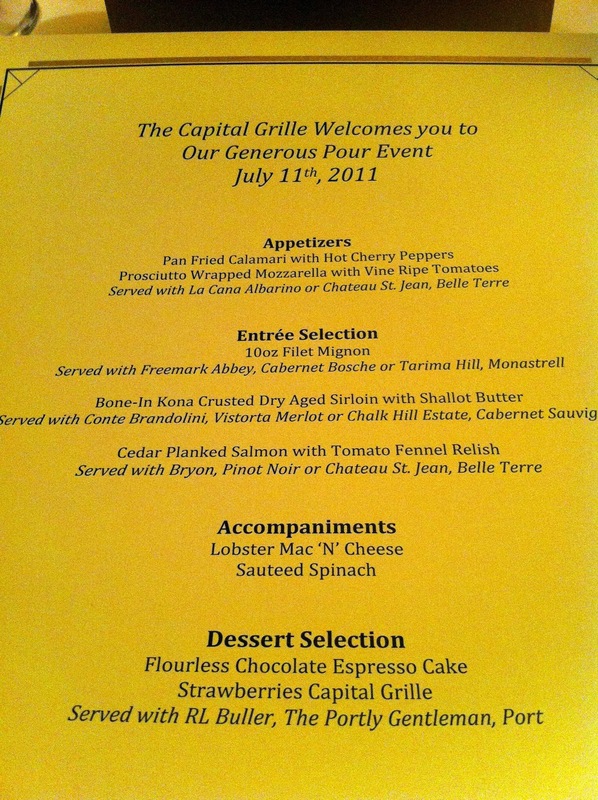 Something I've forgotten to mention were the wine pairings. 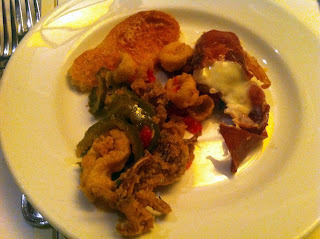 For each course we had two different selections (as could you if you take part...). The highlight to start was the Marquis de la Tour, NV (sparkling wine), while my steak paired well with the delicious Chalk Hill Estate Cabernet Sauvignon, 2006. Each main had different pairings so the Tarima Hill Monastrell, 2009 was a top choice with Erica's fillet. Finally, the dessert course arrived with a delicious wine called The Portly Gentleman from Australia. 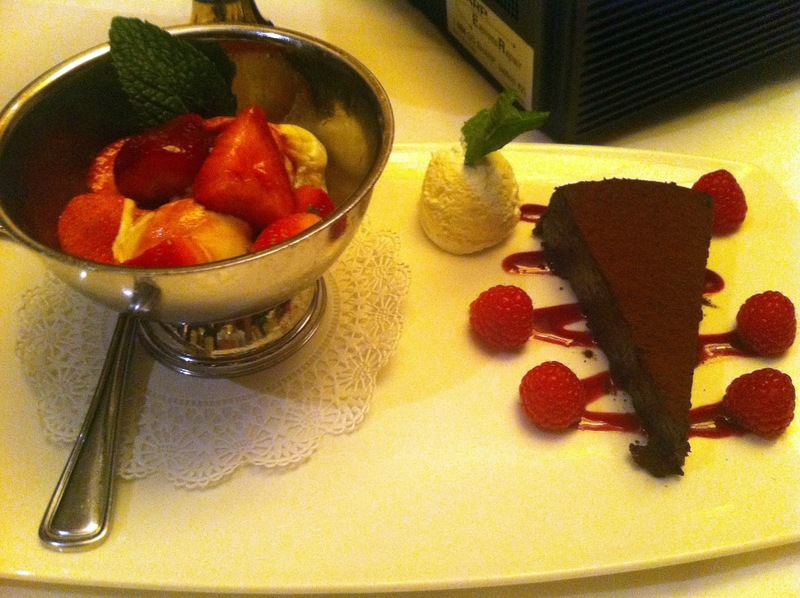 It went perfectly with our flourless chocolate espresso cake and strawberries in vanilla ice cream. I'm not much for chocolate cakes but this was excellent and the ice cream and strawberries hit the spot. I was lucky our server was extremely generous in his offering of the "port." A real nice way to end the meal. 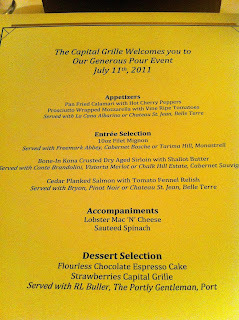 I don't know many people that have been to The Capital Grille but count me as one of their fans. It was a generous (wink wink) event that allowed us to experience their high quality food as well as preview a fantastic deal for wine drinkers. I really enjoyed my steak (something I haven't said in a while), and thought our appetizers and sides were equally impressive (followed by a rich and satisfying dessert). Any meal is going to taste a little better when you don't have to see the bill, especially when good wine keeps flowing too. But I would recommend TCG and will keep it high on my list for a good steak dinner in the city. AND don't forget to go now while the Generous Pour event is available. More details below. The Generous Pour Wine Event is a tasting experience offered by The Capital Grille to rival all others, all for just $25 per person at dinner from July 12 through September 4. Guests may sample all nine wines or they may choose to have multiple tastings of one or more of their favorites from The Generous Pour – their server will guide them through the experience, suggesting pairings for each course ordered and providing each person with a summary of tasting notes. The restaurant will also prepare custom wine flights upon request, for those guests interested in comparing and contrasting The Generous Pour selections. Each featured wine was specially chosen from unique vineyards around the world by The Capital Grille’s Master Sommelier, George Miliotes, one of only 173 Master Sommeliers in the world. The Generous Pour Wine Event introduces guests to some of the season’s newest wine trends, while also offering hard-to-find varietals as well as known favorites. · Tarima Hill Monastrell, 2009 – Making its U.S. debut at The Capital Grille this summer, this spectacular varietal is setting a new standard for Spanish medium-bodied red wine. · Chalk Hill Estate Cabernet Sauvignon, 2006 – Named for the volcanic chalk under the vineyard’s hillside surface, which gives a delightfully unique quality to the wine’s flavor, this rich, dense wine is one of Sonoma Valley’s best. · Marquis de la Tour, NV – This sparkling “bubbly” hails from a vineyard in France’s Loire Valley, which has been producing excellence since 1885. · Conte Brandolini Vistorta Merlot, 2006 – Harvested from 100-year-old vines in a small vineyard in Northeast Italy, this merlot epitomizes powerful elegance. 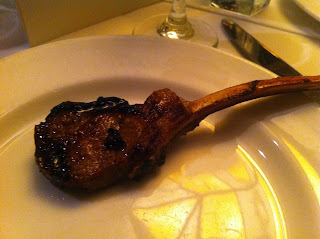 I would have tried the bone in sirloin.